Cannabis can be administered very efficiently by inhaling the active ingredients with the use of a vaporizer. When cannabis is smoked, a range of harmful chemicals are formed in the smoke. The alternative is to heat cannabis in a vaporizer, which releases the active ingredients without burning the herbal material. With inhalation, medicinal effects occur rapidly, making it easier to find the proper dose. As a result, vaporizing is a great mode of administration for treatment of acute symptoms. There are many different types and brands of vaporizers on the market. The NCSM recommends the Volcano vaporizer, because of its scientifically proven safety and quality. The NCSM offers the Volcano for sale to medical patients. You can also try it out before you decide to purchase one. Cannabis contains a variety of constituents with a possible medicinal effect. All of these constituents can be evaporated (vaporized) from cannabis material at sufficiently high temperatures. During inhalation they are quickly absorbed by the lungs. 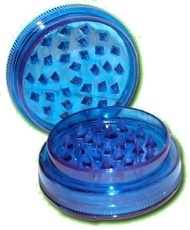 For an optimal effect, pulverize the cannabis with your fingers, or grind it with a mechanical grinder (see picture below). Decreasing the particle size of the cannabis facilitates the evaporation of active ingredients from the plant material. A good starting dose is a teaspoon (not heaping) of ground up material. This is equivalent to about 200 milligrams. Obviously, the amount of cannabis needed depends on the patient and the symptoms that are being treated. When you know you need a high dose, it is possible to use more cannabis and prepare a ‘stronger’ balloon. Alternatively, you can inhale multiple balloons. The optimal temperature setting for vaporizing the active ingredients from herbal cannabisa is in the range 185-210°C. At a lower setting virtually no active components are released into the vapor. A setting higher than 220°C may lead to a harsher vapor that can irritate the lungs and lead to coughing. Inhaling vapor should preferably be done slowly and deeply. There is no proof that holding your breath significantly changes the uptake of active components from the vapor. Definitely do not try to build up pressure in the lungs by squeezing the trapped air with closed mouth and nose. This may be harmful to your airways. After each single inhalation it is recommended to wait 5-15 minutes in order to evaluate the effects. When a higher dose is needed, take another full inhalation and wait again. This can be repeated until the desired effect is reached, or until side effects become apparent. When using the balloon of the Volcano vaporizer, the active ingredients in the vapor will be stable for up to 60 minutes. You therefore have sufficient time to inhale the full content of the balloon without hurrying. The amount of THC present in exhaled vapor is very low, and should not be considered harmful to other people. The first effects of inhaled cannabis quickly become apparent, sometimes as fast as 5 minutes. After this, effects will typically hold on for 3-4 hours. The rapid effect makes inhaled cannabis specifically suited for treating acute symptoms with variable intensity and flare-ups, such as spasms associated with MS, and certain types of pain. For chronic complaints with a more continuous character (e.g. chronic pain) it may therefore be needed to repeat inhalation several times a day. Inhalation of medicinal cannabis with the use of a vaporizer is a good alternative for patients who are used to smoking cannabis. The medicinal effects are comparable, but vaporizing does not produce the harmful side effects of smoking. The great reduction in harmful byproducts (smoke, tar) and smell will also be appreciated by people around you!